So. Many. Video. Game. Toys. At. Toy. Fair. 2011. How 'bout we put a bunch of 'em in a gallery, huh? Sound good? 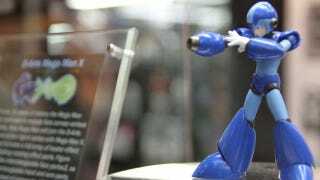 This is Mega Man from D-Arts. NECA's Duke Nukem Forever statue figure, set for April release. NECA's Claptrap (from Borderlands), scheduled for May. Medal of Honor RC war vehicles from Interactive Toys, each armed with infrared sensors so they can battle. Need for Speed Mega Bloks, the first time the Lego-like company is doing anything with EA's popular racing game series. Tekken 6 Jin Kazama 1/4 scale polystone statue from Triad Toys, coming out later this year. Angry Birds plushies and "playground balls" from Good Stuff. There was a whole other booth full of Angry Birds stuffed animals, but they didn't want pictures of their stuff taken. Too bad for them. Early statues for the next Deus Ex game, mostly unpainted, from Square-Enix. An unpainted sneak peak at the hero of Metal Gear Solid: Peace Walker from the toy and statue wing of Square-Enix.